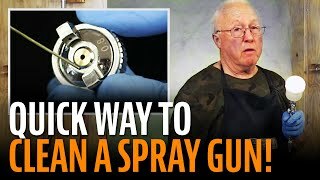 Clean gun = Better finish! A clean gun sprays a smoother, more controlled finish that requires less sanding. Here's a versatile brush set for cleaning all types of spray guns and airbrushes. Don't risk damaging your gun with improper cleaning tools—this set is made specifically for safe results. Order an extra set for cleaning guitar hardware and tools, too! Unclogging a spray gun and keeping it clean: these are the tips Dan Erlewine teaches to the young luthiers who work in his guitar repair shop. I use it for tons of things besides cleaning my spray guns. Perfectness in spraying lacquer is essential and this kit makes it attainable. Haven't used them yet, but they are quality and will work perfect! I don't really use this for my airbrush but I'm sure it is useful or a real spray gun. I do use all the little pieces for a bunch of random things. Mainly cleaning hard to reach areas and poking small dirty holes. Worth having around. There were more brushes in this kit than I'll ever need. Might be great for a heavy spraygun user, tho. Nice kit,,you can clean what ever you want with that,,all size of brushes its a complement for cleaning small parts. A very handy kit to have, much better than fooling with the wrong tools, like trying to clean your spray tip with an old toothbrush: we've all been guilty of that at some time or other. A surprisingly necessary, yet often forgotten tool. No shop should be without! This is an essential tool kit. It cleans my spray gun perfect. Moreover, I didn't realize its other uses until I saw Dan Erlewine's suggestions. Thanks Dan.